I love those soft serve cones that they serve at McDonalds which are dipped in chocolate (not sure what the ingredients are but they sure do taste heavenly). One day, T and I were craving Chocolate dipped ice-cream and headed towards the nearest McDonalds and to our dismay found that they did not have it – no explanation was provided..whether they ran out or they did not carry it any more. When asked they just said – we don’t have it. Now, no one can keep 2 determined ladies from having what they want! So we decided to look up the recipe for making chocolate dipped cones and we FOUND it. YAAAH! Also, in the search process we found that the hard chocolate shell is called Magic Shell. The reason being, the moment this chocolate sauce gets in touch with the cold ice-cream it turns into this yummy hard shell of chocolate like the ones you see in store bought cone ice-creams.. The best part – it needs only 2 ingredients! Yes, you heard it right or rather read it right – coconut oil and chocolate chips. 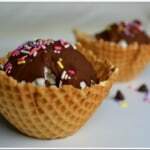 So, no more trips to McDonalds + I can make my own Chocolate dipped ice-cream when I want it! 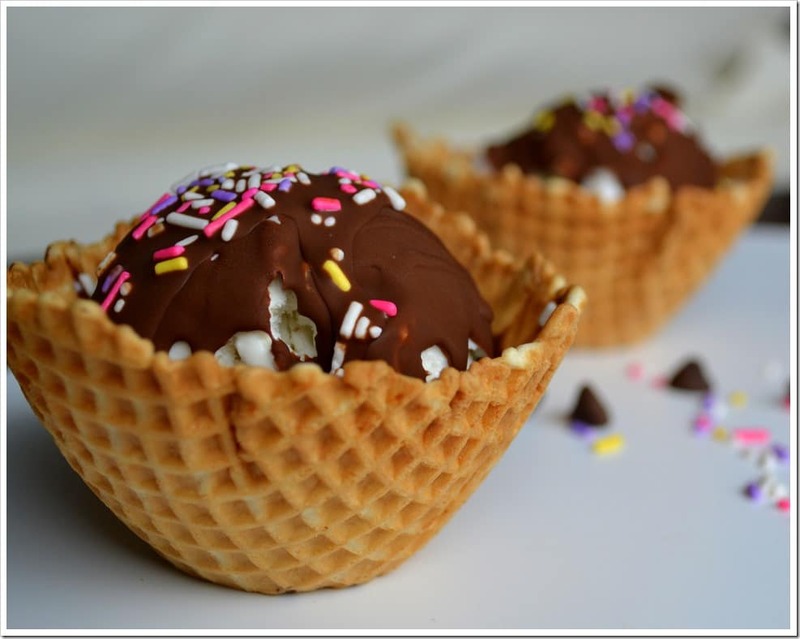 Also, not to mention that my daughter thinks I am the coolest mom on earth for being able to make my own chocolate dipped ice-cream at home– priceless. Mix chocolate chips and coconut oil and heat in a microwave for 15 seconds. The resultant mixture is a sauce which flows freely. Add it to freshly scooped ice cream and watch it harden. Store the remaining mixture in a jar. No need to refrigerate. If it solidifies, just warm it for a few seconds in the microwave and it is ready to go.